Welcome To Pine Lake Laboratories. Working with clients to assist in bringing innovative, safe new medicines and medical devices to patients in need. Our team of experts are waiting to hear from you. Pine Lake Laboratories is here to help. Why Choose a Small CRO over a Top 10 CRO? Pine Lake Laboratories is a small GLP/GMP compliant analytical and bioanalytical contract testing laboratory that is FDA registered located in Bristol, CT. Pine Lake Laboratories has extensive experience with method development and validation and specializes in early development work. Pine Lake Laboratories has the capabilities to help pharmaceutical, medical device, and contract manufacturing companies get their product to market faster and more efficiently. Contract Research Organizations that promote “one stop shop” services with various locations are competitors and are sometimes chosen as the ‘safe option’ due purely on total number of resources. However, choosing a large scale CRO comes with problems of its own; stakeholder ambiguity, increased regulatory scrutiny, and ridged bureaucracy. Small or midsize projects become less of a priority to companies with the most purchasing power. We give unwavering service across the board, no matter your size or name. Choosing a smaller contract research organization comes with advantages; flexibility, swift decision making, personalization and communication. There is no barrier between client and President of the company, or large steps from sales to scientist. All employees have a voice and can help the client succeed in getting their product to market safely. Pine Lake Laboratories understands that the industry is continuously growing and innovating. We strive to be as flexible and adaptive for our clients because we know they are fully immersed. For example, a client may be informed by their vendor of a upcoming material change in the bio-processing system and we will pivot our study plan accordingly for this new material. Moreover, being a small business, we accept projects that can be seen as a “risk” to large companies; a project that takes a lot of resources due to it being more ‘experimental’ in nature. Pine Lake Laboratories will listen to your companies needs and use our expertise to come up with workable solutions to meet your budget and your teams’ goals. Pine Lake Laboratories is a dedicated partner in all of the projects we work on and we will remain fully engaged until our customers are satisfied. The pharmaceutical industry is constantly changing, from new ideas, regulatory guidelines, and best practices. Large CROs could have a hard time adjusting to change, small CROs don’t focus on the high throughput, rinse and repeat strategies. Pine Lake Laboratories will go the extra mile for your product, they have the instrumentation and knowledge to complete your testing and create a data package that can be submitted directly to the FDA. All customer requests are explored and only accepted if we bring value to a project. Each client is given a personalized study design that will satisfy all their goals for their product. If a service is needed that Pine Lake Laboratories cannot fulfill, we can either outsource or make a referral to an appropriated trusted partner so that our client has piece of mind. Furthermore, we are able to adapt new study designs quickly and smoothly with our well versed cross-trained experts and all without the unproductive layers of red tape. Employees from Pine Lake Laboratories come from diverse scientific backgrounds. They bring experience from both small and large pharmaceutical and biotech companies. Pine Lake Laboratories is confident in our abilities to bring the correct technical expert to the discussion table to provide our clients with a full range of GMP and GLP analytical solutions. All of our employees are dedicated to establishing trust, integrity and delivering results required to build lasting client relationships. Clients can be assured they will not just be another number with Pine Lake Laboratories. Moreover, Pine Lake Laboratories specializes in services such as CMC Analytical, Extractables and Leachables, Bioanalysis and more. Our equipment required for our service offerings is state of the art. Moreover, our employees are not siloed into just one technique. All employees participate in the continuous learning program at Pine Lake Laboratories, in order to refresh or educate all employees on leading industry practices. Not one scientist is a specialist on one service or instrument; they are all experts, highly trained on all services and instrumentation. At Pine Lake Laboratories our clients are treated as coworkers. We take time to understand their goals and mission. Their mission statement becomes a part of ours; clients can express their visions, struggles, and outlooks. A call or visit from the President of Pine Lake is only a simple request away and easily accommodated. Dr. Kurt Moyer is happy to visit clients’ offices to meet project teams and fully explain the capabilities and services Pine Lake Laboratories has to offer. Furthermore, visits to Pine Lake Laboratories are also welcome- before or during projects. Clients may want to take a tour of the facilities, meet the team, conduct an audit, or visit during a specific milestone of their testing. Pine Lake Laboratories makes every step of the process as painless as possible; from quote generation to final report. Again, they can easily speak with our key employees to get any answers to their questions. Pine Lake Laboratories is a GLP/GMP compliant analytical and bioanalytical contract testing organization that has the capabilities to solve even the most challenging of analytical problems by partnering with our clients, being adaptive, innovative and accommodating, as each client is a valuable member of our team. The following are questions that are commonly asked about forced extraction studies. These questions were answered by Pine Lake Laboratories CEO, Dr. Kurt Moyer. What sample should I use? Should the sample be pre-treated? What size sample will be extracted? How do you correct for contamination? What analytical methods do you use? 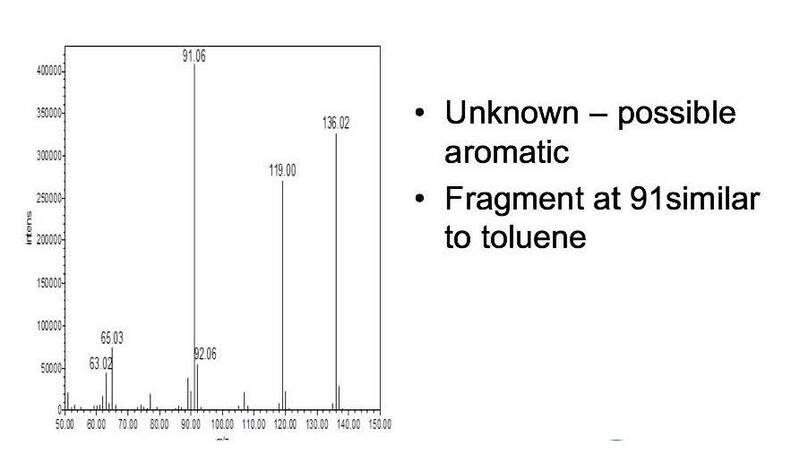 How do you determine which chromatographic peaks are extractables? How do you identify extractables? Can you show me an example study? Samples should be identical to the intended marketed products as well as have a unique name and lot number. Each sample should be prepared as it will be in the final product (no more, no less). Moreover, there should be no additional cleaning. Furthermore, samples may be cut as needed to enter extraction apparatus. 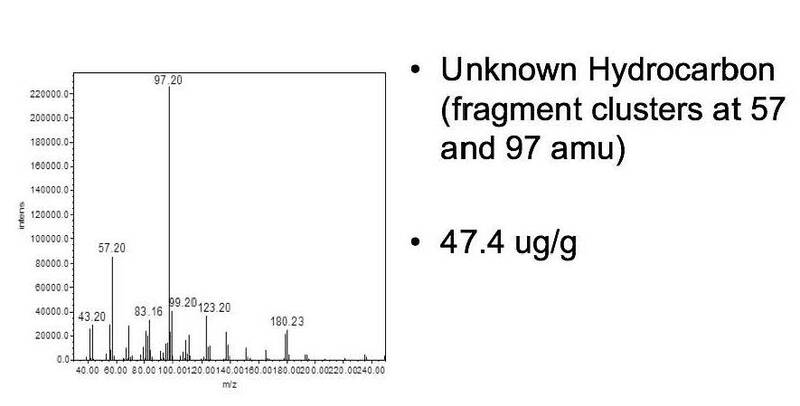 For exaggerated extractions, I recommend sample size to be selected on targeted limit of detection of extractables in the component. How do you correct for laboratory contamination? During analysis, inject blank immediately before sample extract when possible. Exclude peaks observed in blank, unless sample extract peak is more than 3x larger. Include peaks with a S/N above 10 or above determined LOD of method. Aqueous extracts were extracted with equal parts of methylene chloride. Organic extracts were injected neat. During manufacturing, medical devices are exposed to a wide range of processing agents and materials. Depending upon the medical device, residual levels of these processing agents and materials pose a potential toxicological risk to patients. Therefore manufacturers of medical devices need to identify and properly control for contamination of the medical device from processing agents and materials encountered during the manufacturing of the device. This is done by validation of the cleaning of the medical device. For the validation of the cleaning of a medical device, a cleaning limit needs to be established for each residual processing agent. The cleaning limit is the level below which the residual processing agents pose no risk to the patient. Traditionally this is done by performing a toxicological assessment following ISO 10993-12 on each individual processing agent (and each component of a processing agent if it is a mixture) and setting a cleaning limit for each chemical. When the total number of possible chemicals from the processing agents is small (less than 10) and all have toxicological data available, this is the preferred approach. Unfortunately, this is commonly not the case. If the manufacturer is faced with a large number of potential chemical residues from the processing agents (greater than 10), the time and cost of a complete toxicological assessment to set the cleaning limit of each component may be prohibitive. Also, complete toxicological data may not be available in the literature which could prevent the determination of the cleaning limit for a specific compound. At Pine Lake Laboratories, we have developed an approach to assist medical device manufacturers when faced with the challenging task of setting cleaning limits for a large number of potential contaminants from process agents or when complete toxicological data is not available. Our approach is to set a worst case scenario cleaning limit and then testing the medical device by a battery of sensitive analytical techniques to determine which of the potential contaminants are actually present on the device at a level that could potentially present a risk to the patient and eliminating from further evaluation any contaminants that are present at levels that present no risk to the patient. Establish and maintain procedures to prevent contamination of product by substances that could be expected to have an adverse effect on product quality. Establish and maintain procedures for the use and removal of manufacturing materials to ensure that it is removed or limited to an amount that does not adversely affect the device’s quality. As should be obvious, any residual processing agent that presents a toxicological risk to the patient would adversely affect the quality of the device. Process agents are to be removed from product during manufacture. As can be seen, both sets of regulations require cleaning validation for certain types of medical devices and manufacturing practices. Before starting cleaning validation, the manufacturer needs to identify all of the manufacturing materials and processing agents that contact the medical device. This is done by evaluating the complete manufacturing process from beginning to finished product. Organic residuals. Examples: lubricants, detergents and disinfectants. Inorganic residuals. Examples: metals and metal ions. Particulates. Examples: Metallic particles from a cutting process. The end result of the process review should be a complete list of all possible contaminants that could be on the device. The manufacturer can perform a risk analysis to determine the likelihood of each processing agent remaining as a residue on the medical device. For example, consider the following hypothetical process. A medical device is exposed to chemical A in the first step of the manufacturing process and chemical Z is introduced in the last step. After the medical device is exposed to chemical A, the medical device undergoes 3 steps in the manufacturing process that are likely to wash off chemical A before the device is exposed to chemical Z. Therefore, chemical Z is much more likely to remain as a residual than chemical A. In this case, the manufacturer could use this risk assessment to focus more on chemical Z during the cleaning validation following proper documentation of the risk assessment. After the potential hazardous contaminants from the manufacturing process have been identified during the risk assessment, the acceptable level for the contaminants is determined. Ideally, a toxicological assessment should be done for each potential contaminant. However, if a large number of potential contaminants have been identified, the time and cost of a complete toxicological assessment may be prohibitive. In this case, the determination of a worst case scenario cleaning limit is recommended. To determine a worst case scenario cleaning limit, a level needs to be determined below which even the most toxic contaminants would not present a risk to the patient. Unfortunately, the Quality System Regulations and guidances from the US FDA do not provide any assistance in evaluating the toxicological risk of contaminants on a medical device. However, guidelines from the pharmaceutical industry do pertain to establishing thresholds for patient exposure and can be applied to this situation. “A Threshold of Toxicological Concern (TTC) concept was developed to define an acceptable intake for any unstudied chemical that poses a negligible risk of carcinogenicity or other toxic effects”. These acceptable intake levels are based upon exposure and are determined for mutagenic compounds. Mutagenic compounds represent the worst case scenario for toxicity; therefore any compound below these levels for the listed duration of treatment would present no toxicological risk. Although these recommendations were developed for pharmaceuticals, the acceptable daily intakes are only based upon toxicity and the daily intake by the patient. Therefore a manufacturer of a medical device could use these levels based upon the intended exposure of the patient to the medical device. Where elution time is the time required for 100% of the individual potential contaminant to elute from the device into the patient and the number of devices is the expected total number of devices used on the patient. Since the elution time is most likely unknown, the worst case scenario would be for entire amount of the potential contaminant to enter the patient on first exposure, so 1 day is used as the elution time for the CLwc. If the number of devices is variable, a realistic estimate of the largest number of devices is used. The final units for the CLwc are µg /device. Instead of the number of devices, an amount of device (i.e. weight, surface area, length, etc.) can also be used. Once the CLwc had been calculated, the medical device is tested for residual process contaminants from the manufacturing process. An analytical testing strategy needs to be developed that will detect all of the processing agents identified in the risk assessment of the manufacturing process. While the analytical testing strategy will need to be specific to the manufacturing process and the medical device, each analytical testing strategy will include the following steps: washing the residues from the medical device, testing the washes for the processing agents, evaluating the results against the CLwc, and setting compound specific cleaning limits. The first step is to wash the medical device in solvents that are expected to dissolve the processing agent. The residual processing agents are likely to have varying polarities, therefore more than one solvent will probably be needed. Usually water and an alcohol, like Isopropanol, will be sufficient but other solvents may be appropriate based upon the expected residual processing agents. The solvents selected and the conditions should be appropriate for the purpose of washing contaminants from the surface without being so aggressive as to dissolve or cause leaching from the medical device. The level of the residual processing agent is below the CLwc. The residual processing agent would not present a risk to the patient and therefore the device would be considered clean from this processing agent. The level of the residual processing agent is at or above CLwc. The residual processing agent should be submitted for a toxicological evaluation to set a compound specific cleaning limit as described in the next section. The manufacturer should follow ISO 10993-17 to set the cleaning limits for each processing agent above the CLwc. When limited toxicological data is available, at a minimum the LD50 values (readily obtained from the MSDS) can be used to calculate the compound specific cleaning limit. The compound specific cleaning limit will likely be higher than the CLwc. If the level of the residual processing agent observed from the analytical analyses is below the compound specific cleaning limit, the device would be considered clean from residual for the processing agent. If the level of the residual processing agent is above the compound specific cleaning limit, the device would not be clean from that processing agent. Manufacturers of medical devices are required to demonstrate that their medical devices do not present a threat to patient health from residual processing agents. An experimental strategy was presented that allows the manufacturer to test for all of the potential residual processing agents on the medical device based upon the determination of a worst case scenario cleaning limit. For medical devices where there is a risk of a large number of residual processing agents, the manufacturer may find this approach to be more efficient and less costly than determining the cleaning limit for each compound from a toxicological assessment. ISO 13485:2003, Medical devices — Quality management systems — Requirements for regulatory purposes, section 7.5.1.2.1. Pine Lake Laboratories is the scientific leader in extractables and leachables (E&L) studies. We have extensive experience with pharmaceutical container closures, single use system components, and combination devices. Protocols are designed to be study specific and follow PQRI, BPOG or client specific. Pine Lake Laboratories can also perform USP <661.1> and <661.2>. A toxicological risk evaluation for E&L results can be performed by our staff toxicologists. In the present article we summarize what we’ve learned in the period since our earlier article appeared in Journal of GXP Compliance some years ago, entitled “Implementing Quality Agreements at the Contract Laboratory”1. Specifically, here we focus on how the lab gets the Quality Agreement “right” and then follows it throughout its lifecycle by identifying what we call key “check points”. Our experience has shown that there are points in the Quality Agreement process, by which we mean the process of drafting, approving, implementing and revising the Quality Agreement, that are particularly problematic because they require greater attention and/or pose greater risk and it is key to manage these. A major challenge at the contract lab (CRO) is to handle Quality Agreements (QAGs) through some standardized procedure, while at the same time allowing for the diverse needs of a wide client base. This becomes more evident when one considers that the QAG typically originates with the client, in their format, and therefore contains many client-specific idiosyncrasies. Furthermore, the contract lab may be performing laboratory testing under GLP, GMP and/or ISO laboratory testing protocols, which, although greatly similar to one another, will each have its own unique requirements. Procedures, to be useful, must be detailed enough for personnel to be trained on and to follow. However, to be standardized across the wide client base, they must not be too detailed. One cannot have a procedure for each client. Management must therefore “see the forest for the trees”. There should already be in place a strong quality program at the CRO and the QAG must make a good fit to this program. Those concerns (terms) that are rather common to Quality Agreements should already be addressed in the existing quality program at the CRO or else consideration must be given to incorporating them into the existing program. This approach is distinctly different and better than leaving them only in the QAG. To leave important concerns only in the QAG is tantamount to instructing the lab to only consider doing such quality work when working on this particular client’s project. Understand and have input into specific terms of the agreement. It is important to make a careful review of the draft. Don’t agree to terms that you cannot meet. Take a team approach in order to foresee any/all difficulties in implementing the terms by involving lab Management, Principal Investigators and Quality Assurance in the draft review. Many of the high-risk terms are those that are specific to the client. By high-risk, we mean at risk of being ignored during the conduct of the study. 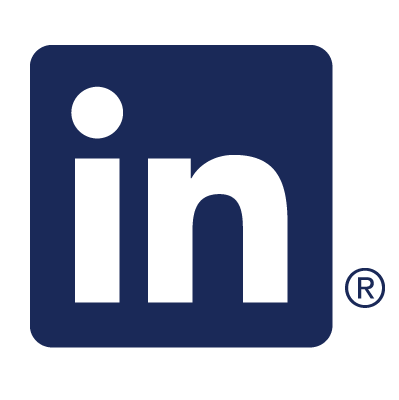 For example, how and when the client is to be notified of an out-of-specification result is typically client-specific and terms involving notifications to be made to the client are generally high risk. Other terms that are often high risk center around how changes to laboratory procedures, testing protocols and written instructions in general are to be handled and how vendors and other 3rd parties providing materials and/or services in support of the client’s experimental study are to be qualified2. Quality Agreements are to be used. They are not to be put on the shelf and then forgotten. Keep track of who has been trained on each. This can be done with a training matrix. 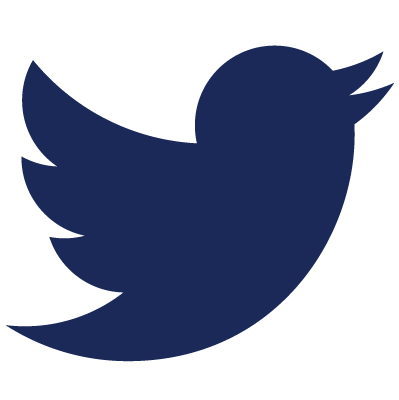 It is a good idea to keep an updated list of the agreements that are active (e.g. the training matrix) in a place highly-visible to all employees. To make it more useful, consider cross-referencing each QAG against the client and perhaps also to the Principal Investigators assigned to the client’s various experimental studies. To protect client-confidentiality, consider using a client code in place of the client name. A mechanism must be in place to ensure that the training is performed on a timely basis. Couple this training to some other required client-based activity that occurs at an appropriate time in the process of taking a client project from start to finish. For example, we start each experimental study using a kick-off meeting facilitated by the Principal Investigator (PI), who is guided by a kick-off meeting checklist3. Listed on the checklist is the requirement to review any applicable QAG. All scientists participating in the study are required to attend and to sign the attendance sheet. The attendance sheet is forwarded to the Training Coordinator, who uses it to update the Training Matrix. Any person missing the training must make it up and this will involve among other things, reading the QAG and passing a quiz on it. Attendance sheets are filed in the employees training binder. Create an SOP on Quality Agreements. In it, provide background and details on the QAG system in place in general. All employees supporting client studies must be trained on this SOP. Quality Assurance should keep the original QAG. QAGs are often 20 to 30 pages in length. It is a good idea for the QAU to also keep a one-to-two-page summary of key points appearing in the QAG and to note those points that the QAU anticipates causing more trouble to the lab or that may present a greater risk. The effective start and expiration dates along with client contact information should be included. The summary does not take the place of the QAG. Any deviation from a QAG should be considered “major”, requiring a deviation investigation in order to identify root cause and corrective and preventative actions for Management and Quality Assurance review and approval4. The specific QAG will state whether or not the deviation is to be reported to the client and if so, how it is to be addressed with the client. Quality Assurance must query the CAPA database to determine if there is a pattern of failures to follow a specific QAG or QAGs, in general. Such feedback is critical to improving the QAG system and may help to improve specific Quality Agreements. Of course, the more effort put in at the front end to establish a good agreement and to train everyone on it, the less effort needed on the back end. Perhaps more importantly, like any quality system, a good QAG system will scale up with no difficulty as more and more clients desire to put QAGs into place with the lab, whereas a bad system simply will not. The effective implementation of a single Quality Agreement and the management of a quality agreement program at the Contract Research Laboratory, requires getting good QAGs into place and monitoring the lab’s performance in implementing them over time. Key to the management process is the identification and understanding of points in the workflow at which to make critical checks. Laboratory”, Journal of GXP Compliance, Vol. 16, Issue 4, 2012. Contract Laboratory”, Journal of GXP Compliance, Vol. 17, Issue 3, 2013. Laboratory”, Journal of GXP Compliance, Vol. 19, Issue 2, 2015. Laboratory”, Journal of GXP Compliance, Vol. 21, Issue 2, Mar 2017. The demand for sophisticated drug delivery has led to the development of many innovative combinations of pharmaceuticals, biologics and medical devices across a broad range of therapeutic areas. While these combination products have the potential to fulfill major unmet medical needs, they also present unique challenges in development and approval. One of these challenges is the development and validation of analytical methods to assess the quality, safety and stability of combination products. The FDA Guidance for Industry Titled, “Current Good Manufacturing Practice Requirements for Combination Products (January 2017)” defines a combination product as “a product composed of two or more types of medical products (i.e. a combination of a drug, device, and/or biological product with another).” There are three types of combination products: single entity, co-packaged and cross labeled. A single entity combination product has two or more related components (i.e. drug/device, biologic/device, drug/biologic or all three) that are physically, chemically, or otherwise combined to produce a single entity. Examples of single entity combination products would be a prefilled syringes or a drug eluting stent. A co-packaged combination product has two or more components packaged together in a single package. Examples of a co-packaged combination product are surgical and first aid kits. With a cross labeled combination product, each component is packaged separately and is intended only for use with an approved second product. An example of a cross labeled combination product would be a light activated drug requiring a light emitting device. Single entity combination products (SECP) present unique analytical challenges compared to co-package and cross labeled combination devices. Most notably, a SECP runs the risk of impurities and degradants from the combining process and sterilization. In addition, an SECP may have specific design features that need to measure to ensure proper functioning of the product. As a result of these unique analytical challenges for SECPs, this white paper will focus only on the analytical methods needed to support the development of an SECP. For brevity, this white paper will only discuss SECPs formed from a drug and a medical device. Similar approaches with the appropriate methodologies could be adapted for the other types of SECPs. There are three goals for these methods: to assay the drug content, to measure for known related substances and to detect degradation products of the drug. 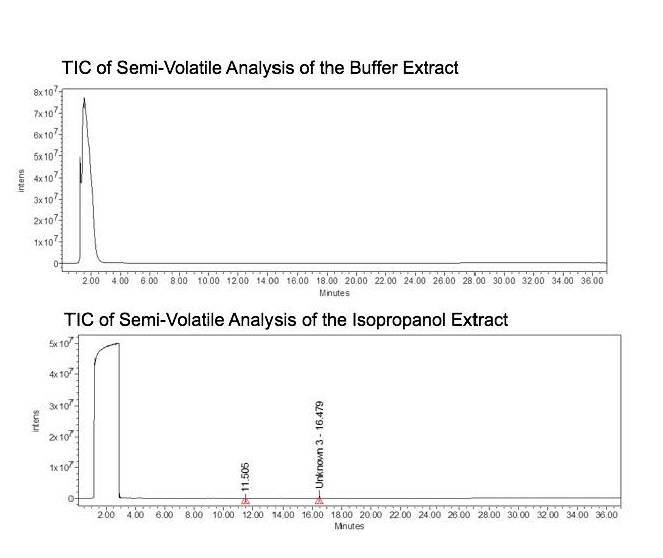 Like the analytical methods for more traditional drug products, the predominant instrumentation for these methods is high-performance liquid chromatography (HPLC)- UV, with one method usually able to accomplish all three tasks. The main difference between analytical methods for SECPs and traditional drug product formulations like oral or parenteral dosage forms is in the sample preparation. The sample preparation is unique and specific to the SECP but usually involves complicated multi-step procedures. Based upon the SECP, sample preparation of SECPs often involves extensive extraction for complete recovery of the drugs. In addition, depending upon the size of the SECP and the location of the drug, the SECP may need to be disassembled or reproducibly cut, which can be a significant challenge when the SECP is made from hard plastics or metals. Since the method is intended to be used as to evaluate stability of the SECP, the method will need to be proven to be stability indicating. If the SECP contains a new drug, a forced degradation study will be needed. If the SECP contains a generic drug, literature references to known degradation pathways and impurities can be used to evaluate if the method is stability indicating. However, if the combining process is significantly different from the literature references, additional degradation pathways may need to be explored experimentally. When designing a forced degradation study for a SECP, the potential for the device to contribute to the drug degradation or the degrade itself, leading to detectable degradation products needs to be considered. The type of SECP will determine if the forced degradation study is done on just the drug, on the fully assembled SECP or on a combination of the drug and the parts of the device with direct drug contact. It is recommended to include the components of the SECP that have direct drug contact in the forced degradation study. The conditions of the forced degradation study may also need to be adapted for an SECP. Stress conditions can be replaced with more relevant experimental conditions with proper scientific justification. Once developed, the analytical methods need to be validated according to the ICH Harmonized Tripartite Guideline , Validation of Analytical Procedures: Text and Methodology (ICH Q2(R1)). One important additional consideration for validation of methods for a SECP is during ruggedness. In the ruggedness validation experiments, additional challenges should be added to evaluate ruggedness of the sample preparation. These experiments will vary depending upon the SECP and need to appropriately challenge each critical sample preparation step. If organic solvents are used in the assembly of the SECP, the finished SECP will need to be tested for these residual solvents. A common example would be if the drug is sprayed onto part of a medical device during the assembly of the SECP. In this case, the solvents used in the spraying process would be considered residual solvents. The residual solvents methods need to be developed and validated in accordance with USP <467>. One important additional consideration for residual solvents for a SECP may be the need for additional sensitivity. Because these residual solvents may be important parameters in developing the process to manufacture the SECP, the methods may be needed to reach sensitivities as much as 10 fold lower than the required specification to assist in development of the manufacturing process. Once the methods have been validated, residual solvents testing can be done as part of release testing or as part of the process validation. If the SECP is not intended to mechanically infuse the drug into the patient but instead the drug is intended to passively diffuse into the patient, then analytical methods designed to measure the rate of drug release or elution are needed. To perform this experiment, the SECP is placed in an appropriate media designed to model the target tissue. The analytical method is then used to measure the increase in drug concentration in the media over time. The instrument conditions used are usually similar to those used for the assay; however, more sensitive methods may need to be developed if the release of drug is expected to be slow. The method will need to be validated similar to an assay method with special consideration to sensitivity and additional ruggedness testing for the sample preparation factors that might impact the release date. For SECPs where the medical device is coated with a drug or drugs, the uniformity of this coating will need to be evaluated. Similar to the drug release methods, the instrument conditions used are usually those used for the assay; however, more sensitive methods may need to be developed depending upon the intended level of drug in the coating. In addition, the sample preparation will need to be adjusted so that samples are taken from all areas of the device to ensure uniformity of the coating. In some SECPs where the device is not a simple geometric shape, the surface area coated from the different sections of the device will need to be included in the determination of the level of the drug in the coating. Leachables (a.k.a. migrants) from the medical device need to be considered when the drug is in direct contact with the medical device during the intended shelf storage, when the SECP is intended to be surgically implanted or when the SECP will have direct patient contact for an extended period of time. For these types of SECPs, two types of studies are performed. The first study is a forced extraction study on just the medical device and the second study a migration study on the entire SECP. In a forced extraction study, the medical device is extracted with two solvents at an elevated temperature. Usually the drug is not included in the forced extraction. The extraction solvents are selected so that one mimics either the drug formulation or the intended patient tissue that the SECP will contact and the second solvent is selected to represent a “worse case scenario” condition based upon either the drug formulation or the intended patient tissue. The sample extracts are analyzed by mass spectrometry (gas chromatography, liquid chromatography, or inductively coupled plasma (GC-MS, LC-MS, and ICP-MS respectively)) to attempt to identify all possible organic and inorganic extractables. Analytical methods are then developed that can detect the extractables observed in the forced extraction studies as leachables in either the drug product or a model solvent that mimics the intended patient tissue. Analytical methods for leachables need to be extremely sensitive and usually require MS detection. An additional challenge commonly arises when the drug product is present at concentrations significantly higher than the levels required for detection of the leachables. In this case sample preparation steps and method adaption need to minimize the interferences from the drug. Once developed, the analytical methods need to be validated before proceeding to the migration study. The validation of the methods should be similar to validation of a method for related substances but allowances may be needed to reach the required level of sensitivity. The migration study is the second study where the leachables (a.k.a migrants) are monitored. When the risk of leachables is deemed to be highest from the drug being in direct contact with the medical device during the intended shelf storage, the leachables should be evaluated as part of the stability study to determine the shelf life. When the risk of leachables is due to the SECP being surgically implanted or from direct patient contact, a simulated migration study is performed. In this case the SECP is exposed to a model solvent that mimics the intended patient tissue at 37°C for an appropriate length of time determine by the intended use. In both studies, previously validated analytical methods are used to evaluate the leachables entering the drug product or the model solvent. Since many types of SECPs are in development with many unique critical features, analytical methods may be required to measure qualities specific to a given SECP that are expected to be critical to function properly. In this case the analytical method will need to be developed to address a specific attribute of the SECP. These methods will still require validation even when few of the standard validation parameters apply. In this scenario, the validation should address at a minimum reproducibility and ruggedness. Ruggedness testing should include all method parameters that could impact the reported results. As diverse and ingenious SECPs continue to be developed, analytical methods that can be used to support the development and ensure the quality of these products are needed. A thorough understanding of the SECP is critical to ensure that the analytical methods are monitoring the proper attributes of the SECP and the analytical chemist may need to be creative in developing methods and preparing samples to support these important therapeutic advances. 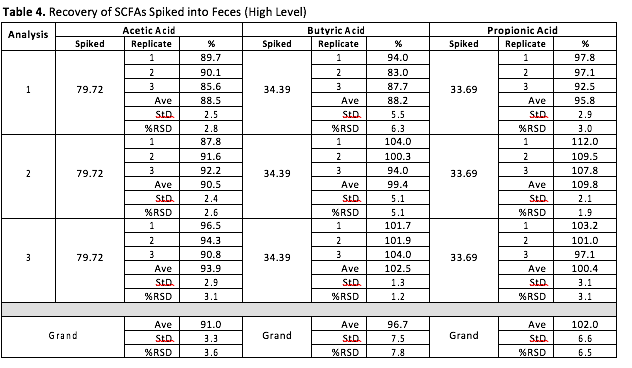 To support microbiome research, Pine Lake Laboratories has developed an assay for short chain fatty acids (acetic, butyric, and propionic acid) in feces. These targeted metabolites can be used as an indicator of microbiome activity in research subjects and as biomarkers to evaluate the effect of various pharmaceutical drug treatments during pre-clinical and clinical trials. The method involves extracting the short chain fatty acids form feces then analysis by direct injection GC-MS. This white paper will describe the method and highlight the performance of the method. Standards and QCs are prepared by spiking known levels of each short chain fatty acid into feces. The endogenous level of each short chain acid in the feces used to prepare the standards and QCs had previously been determined by standard addition. The final concentration is then the total of the amount added and the endogenous level. Standards and QCs are then prepared for analysis same as the samples. 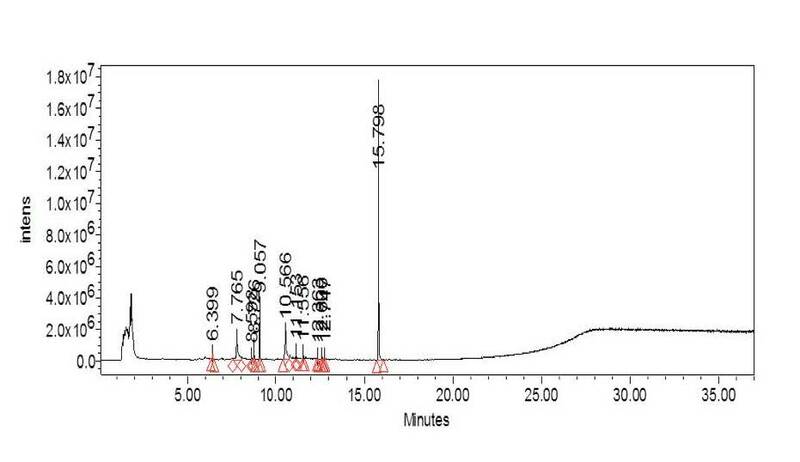 Samples are analyzed by GC-MS using a Nukol capillary column (15 m x 0.23 mm, 0.25 µm). Details available upon request. For all three short chain fatty acids, the range of the method was 5 to 150 μg/mL with R2 > 0.990. Representative calibration curves can be found in Figures 1-3. A representative lot of feces was assayed in triplicate for all three short chain fatty acids. Results are in Table 1. Precision on all matrix samples (n=6) was excellent with %RSD values less than 5% for each SCFA within each of the three analyses. 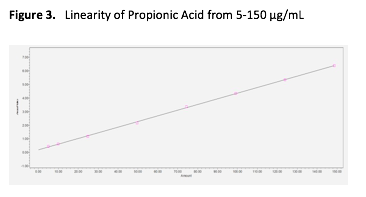 The total precision of the grand average was less than 10% for acetic and propionic acid. 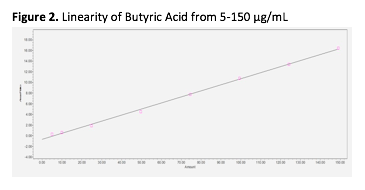 Butyric acid was higher at 26.6% but was still acceptable at less than 30%. A representative lot of feces was spiked at three separate levels with known amounts of each of the three short chain fatty acids. This was repeated in three separate analyses. Results are in Table 2-4. 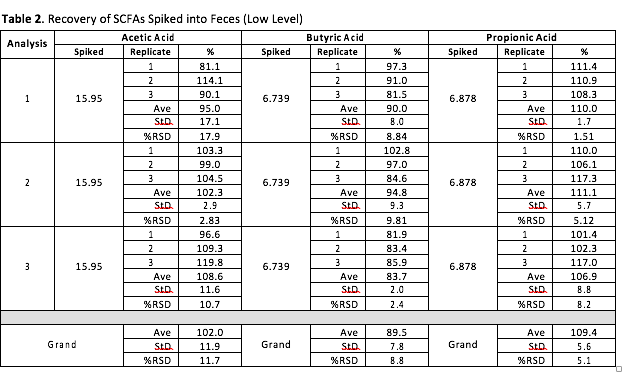 Accuracy was acceptable for all three short chain fatty acids with average recovery within ± 15.0% of target for each level in each analysis and in the grand average. Similarly precision was acceptable at ≤15.0% for each level in each analysis and in the grand average. 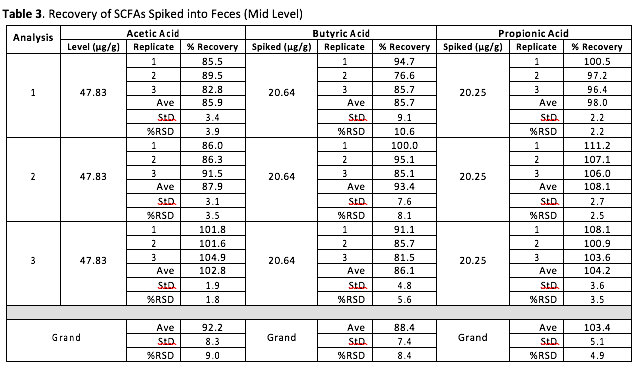 This simple yet effective GC/MS analysis can be used to accurately determine the concentration of acetic, butyric, and propionic acid in feces. The method is specific, accurate, and precise with a large quantifiable range for short chain fatty acids. 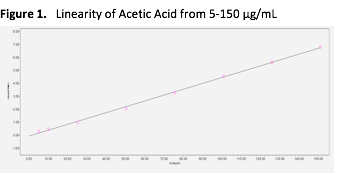 Additional short chain fatty acids not included in the method evaluation reported in this white paper can also be detected and quantitated using this method. Leachables from sample container closure systems (CCS) from primary and secondary packaging component that migrate into a drug products have a potentially negative impact on safety. Analytical methods are needed to detect leachable in the drug product. The first step toward developing analytical methods for leachables is to identify the extractables that could become leachables by doing extraction studies. Extraction studies are designed to simulate both intended use and “worst case scenario” models to identify as extractables the leachables that could migrate into the drug product. Analytical methods are then developed with sensitivity to detect the leachables in the drug product at the threshold determined by the toxicity of the leachable. Analytical methods for leachables are validated similarly as methods intended to evaluate the stability of the drug product. Leachable analysis can then be used in the long term stability studies or in migration studies designed to specifically evaluate leachables. Leachables are compounds that migrate into a drug product from the sample container closure system (CCS) under normal storage condition. Both the primary CCS in direct contact with the drug product (metered dose inhaler, prefilled syringe, eye dropper, IV bag, HDPE bottle, LDPE ampoule, etc.) and the secondary CCS which does not contact the drug product (printed label, cardboard box, foil pouch, environmental exposure, etc.) can be sources of leachables. Leachables present a potential risk to the patient both from the toxicity of the leachable and from the possible negative impact upon stability and efficacy of the drug product. 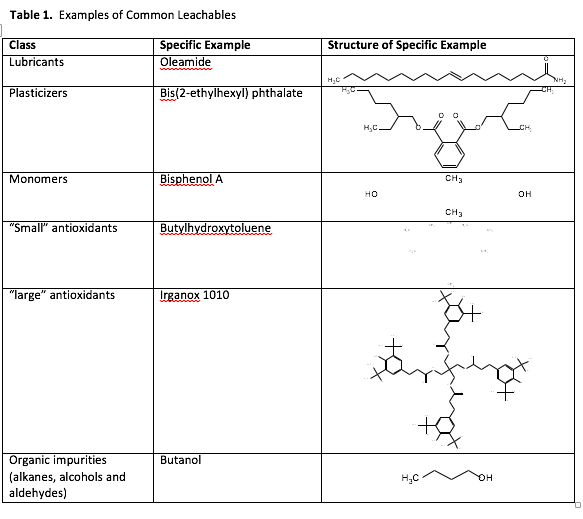 Examples of common leachables can be seen in Table 1. Although many types of materials can be used in a primary CCS system, the three most common are glass, polymers and elastomers. One may expect that the manufacturer of the component of the CCS to be able to provide a complete list of the formulation and process used to manufacture the component, however this may not always be the case. The two main reasons for manufacturers not providing this information are that the manufacturer may consider the information to be proprietary or the manufacturer may not have the information. The second reason is particularly common for polymers. The main reason for this among the manufactures of polymer CCSs is that their upstream suppliers do not need to place strict control over their processes. For example, a resin manufacturer will set specification for their product on its physical characteristics only and then sell the same resin to a manufacturer of a CCS and a manufacturer of lawn furniture. This example resin manufacturer may not have needed to keep accurate records on the amounts and type of antioxidants used as long as the resin met the manufacturer’s specifications, but these antioxidants do have the potential to leach into a drug product. Leachables can enter any type of drug product including solid dosage forms. 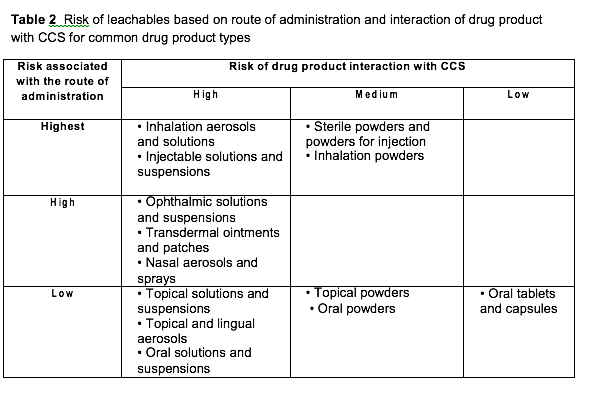 Generally, orally inhaled and nasal drug products (OINDP) and parenteral and ophthalmic drug products (PODP) are the most common drug products at high risk of leachables. Table 2 summarizes the risk for most common drug products. Low risk is not the same as no risk as evident in several high profile of recalls of solid dosage forms due to leachables. An assessment of the risk of leachables into a given drug product needs to be done when considering a testing strategy for leachables. The toxicity of a leachable is dependent upon the route of entry into the body. Levels of a compound that can be safely ingested can have a toxic effect when the same level is inhaled. As a result the potential route of administration of a leachable must be considered when assessing the risk of a leachable. Leachables present unique analytical challenges. 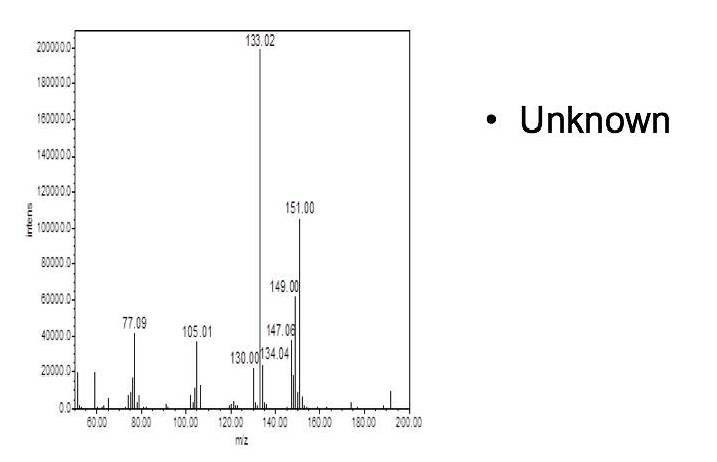 Since leachables are not related to the drug product, the analytical methods used to detect impurities in the drug product may not be able to detect the leachables. Even when leachables could be detected by drug product impurities methods, the leachables are often at levels orders of magnitude lower than drug degradation products or related substances, thus below the sensitivity of the method. Thus separate analytical methods are usually needed for the analysis of leachables in the drug product. illustrates the ideal relationship between extractables and leachables. The conditions of the extraction study are selected based upon the drug product and are designed to mimic a “worst case” scenario for the intended drug product. Care must be taken in the selection process so that conditions are aggressive enough to ensure that the extractables include all leachables while not being too aggressive thus generating an impractically large number of extractables that are not leachables. The extraction study should not lead to a complete deformulation of the material. All components of the CCS that directly contact the drug product either during storage or during the administration of the drug product are considered to be primary components of the CCS. All components of the CCS that do not contact the drug but do have the potential to interact with the primary CCS are considered to be secondary components of the CCS. A secondary CCS component will either contract the primary CCS or contact another secondary CCS component that does directly contact the primary CCS. Table 3 shows some common examples of primary and secondary components of CCSs. components are to be pre-treated in any way (e.g. sterilized) before being filled with the drug product, the samples to be used in the extraction study should be pretreated in a similar manner to ensure that the extraction profile correctly models the CCS exposed to the drug product. Selection of secondary CCS components for inclusion in the extraction study is based upon a risk assessment. In this risk assessment the likelihood of the secondary CCS component giving rise to leachables and the likelihood of these leachables being able to contact and penetrate the primary CCSC are considered. One secondary CCS component that will usually need to be included in the extraction study is a printed label if it is to directly contact a part of the primary CCS. The first step toward evaluating leachables is to perform extractions studies. There are two types of extraction studies; Controlled Extractions and Simulated use extraction. These two extractions can be done in series or in parallel. In some cases, just one of the extraction studies may be sufficient. A Controlled Extraction study (also called materials characterization study) involves extracting the CCS in 2-3 solvents of varying polarities. A CE study using 3 solvents is required for drug products at the highest risk based upon the route of administration in Table 2. A CE study using 2 solvent is recommended for drug products in the other two risk categories for route of administration if the risk of packaging component-dosage form interaction is high in Table 2. The solvents are selected based upon the drug product with at least one of the solvents representing a “worst case scenario”. The extraction conditions used are aggressive, typically reflux or oven incubation. The combination of the “worst case scenario” solvent with the aggressive extraction conditions is intended to yield a high number of extractables. The end result of this approach is that all potential leachables (except those that react or have a unique affinity with the drug product) will be identified. Table 4 shows example extraction solvents for an aqueous drug product. A simulated use extraction study (also called a simulation study) involves extracting the CCS in solvents that closely mimic the drug product. The extraction conditions are usually static storage of the CCS in the solvent at a temperature above the intended storage condition of the packaged final drug product. The end result of this approach is that the observed extractables are likely to be leachables. A simulated use extraction is designed to be less aggressive than a controlled extraction study, thus less extractables are expected to be identified in a simulated use extraction compared to a controlled extraction. The simulated use study is more likely to identify only the extractables that will become leachables compared to the controlled extraction study which will potentially identify many extractables that will not become leachables. However, a simulated use study is more likely to “miss” a potential leachable than a controlled extraction study. Both studies reveal useful information on the potential leachables from a given material but the project team must be aware of the strengths and weaknesses of each study. Regardless of type of extraction study performed, once completed, the sample extracts are analyzed by at least GC-MS, LC-MS and ICP-MS. The goal of these analysis is to identify as many extractables as possible and to semi-quantitatively determine the level of each extractable. Based on the material, additional analysis may be required for specific leachables known to be highly toxic. Since the methods are designed to detect unknowns, these methods cannot be validated. Results from these analyses are reported as the amount of the extractable (usually in µg) per weight (usually in g) or surface area (usually in cm2) of the CCS component. At the completion of the extraction studies, a list of extractables is generated. The challenge at this point is to select which extractables present a toxicological risk and thus should be monitored as leachable. is 1.5 µg of each individual leachable per day. To apply the SCT to a given drug product, an analytical evaluation threshold (AET) is calculated based on the SCT of an individual leachable, the number of doses of the drug product administered per day, the number of doses contained in the container closure system (CCS), and the weight of the CCS (can also use volume of drug product in the CCS. The AET will have units of µg/g unless other units were used in the calculation. Surface area of the CCS or volume of drug product in CCS instead of the weight may be applicable in some situations. The uncertainty factor is an adjustment for the confidence in the identification and quantitation of the extractables needed for OINDP. For all other types of drug products, the uncertainty factor is not needed. All extractables above the AET should either be selected to be monitored as a potential leachable or submitted for a toxicological assement to determine a compound specific SCT. 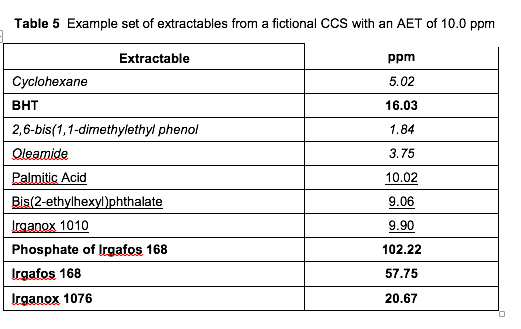 An example set of extractable results are shown Table 5 for a fictional CCS with an AET of 10.0 ppm for each extractable. The results listed in italics are well below the AET and would not be selected as target leachables. The results that have been bolded are significantly above the AET and would definitely need to be selected as target leachables. The results that are underlined represent results that would require additional consideration since the results are close to the AET. The SCT and the uncertainty factor should be reevaluated before selecting or dismissing these extractables as leachables. A conservative selection of including an extractable that is just below the AET as a target leachable is an acceptable and common practice. The goal of the analytical methods is to have sufficient sensitivity so that the LOQ is at or below the AET. Extensive sample preparation may be necessary to ensure sufficient sensitivity. The analytical methods are then validated with the goal to meet the ICH acceptance criteria. However, since the challenge of these methods is to be able to detect very low levels of leachables in often complex drug product matrices, some allowances may need to be made in other aspects of method performance to allow sufficient sensitivity. These allowances may be seen in higher acceptance criteria than in drug product impurity methods. 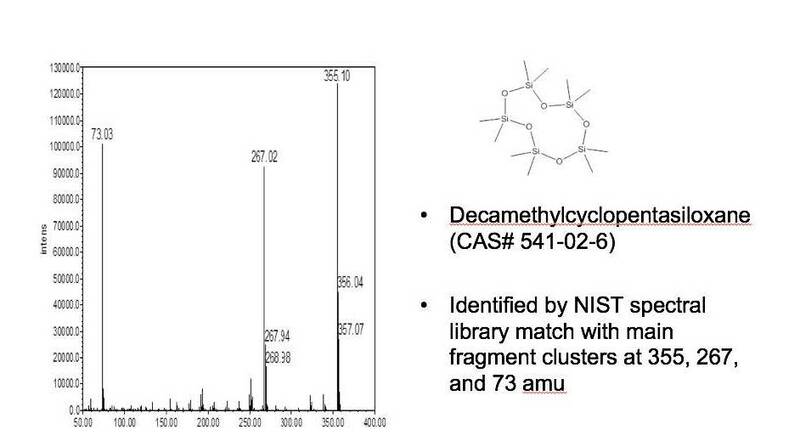 The analytical methods are then used to analyze drug product stored in the CCS under the intended storage conditions. Ideally this testing can be done as part of the stability study but it can also be done in a separate migration study. Results from the analysis are reported as concentration of the leachable in the drug product. If a leachable is observed above the AET, additional experimentation may be necessary to confirm the identification of the leachable. Additional toxicological evaluation may also be needed to assess the risk of the leachable. 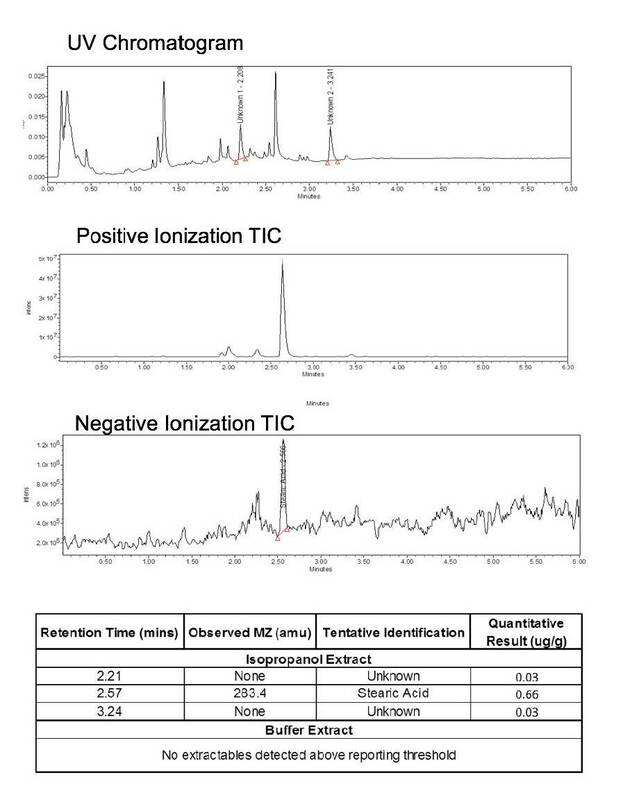 Inclusion of control samples can greatly simplify the analysis of the leachables results. One recommended control is to store the drug product in a different CCS under the same storage conditions for the same length of time. Ideally the different CCS would be expected to yield significantly less and different leachables (e.g. a glass vial with a Teflon coated lid). This control is used to distinguish degradation products of the matrix from leachables. Including placebo samples stored in the CCS in the leachable study is strongly recommended. These samples can help to confirm the presence of leachables observed in the active and leachables might be observed in the placebo that might have been missed in the active. One cannot assume, however, that if a peak is observed in the active that is not in the placebo that the peak is not a leachable. The active drug may facilitate the migration of the leachable or the active drug could react with the leachable. If a leachable is observed in the drug product above the AET calculated for that specific leachable, the project team must take actions to prevent patients from being exposed to this level of the leachable. The options are the shelf like must be shortened to a time before the leachable exceeds the AET or a different CCS must be selected. If a different CCS is selected, the entire extractables and leachables testing must be repeated on the new CCS. If no leachables are observed in the drug product above the AET the project team can set the shelf life and storage conditions of the drug product in the CCS based solely on drug product stability. Thankfully this is commonly the case. Leachables present a unique challenge in assuring drug product safety and efficacy. The experimental approach discussed in this chapter represents a rational experimental approach to evaluate this risk. When a project team designs experiments based on this approach, the more information the team gathers on the material composing the CCS and on the drug product, the more effective and efficient the experimental strategy will be. After the potential hazardous contaminants from the manufacturing process have been identified during the review of the process flow, the acceptable levels for the contaminants is determined. For contaminants with complete toxicological data available, follow ISO 10993-17 to set the cleaning limits for the contaminants. When limited toxicological data is available, at a minimum the LD50 values can be used to calculate the cleaning limits. For most contaminants the LD50 values are readily obtained from the MSDS. The established cleaning levels are then used in the selection and evaluation of the cleaning test methods. 10993-12, the PQRI guidance for E&L testing of OINDP as well as any specific requests for drug compatibility data from CDRH. A hybridized study design, incorporating the essential regulatory elements, has been developed and successfully implemented for a variety of medical device applications. The rationale behind selection of the elements, overall experimental design strategy and interpretation of the resulting data will be presented. the second experimental design for direct migration route of entry. If leachables from a medical device are unlikely to enter the body from one of these two routes, an evaluation of extractables and leachables is probably not necessary. “For each route of administration identified in your statement of intended use, you should identify an FDA approved drug or biologic to demonstrate that at least one such product is approved for infusion through the proposed route of administration and at the proposed dosage. If your infusion pump includes a reservoir, we recommend that you provide stability and compatibility data for each drug or biologic that you have identified above, which assesses the stability and compatibility for the recommended use period and conditions included in your labeling. There are two important requests in this FDA response to the 510 (k). The first request is to assess the stability and compatibility of each drug or biologic intended to be used with the medical device. The second is a safety evaluation of any leachables, extractables, impurities and degradants from the medical device into the drug product. To address extractables testing for medical devices, in the FDA Modernization Act of 1997, the FDA recognized ISO 10993-12 Titled “Sample Preparation and Reference Materials”. In this document are clearly defined extraction experiments for extractable and leachable evaluations. Some of the definitions and experiments in ISO 10993-12 are similar to the definition of an extractable and the forced extraction studies described in the PQRI guidance for E&L testing of OINDP. Acceptance criteria for extractables and leachables are not defined in ISO 10993-12. Based upon the similarities between ISO 10993-12 and the PQRI guidance for E&L testing of OINDP, a study design for medical devices where the route of entry for leachables is in a drug product will be presented that includes elements of both documents. The study design to be presented for medical devices where the leachable route of entry was from direct tissue contact will be based only on ISO 10993-12. Before starting to evaluate drug compatibility and leachables from the medical device, an FDA approved drug(s) intended for use with the medical device must be selected. If the device is intended for just one drug, like an insulin pump, the selection of the drug is obvious. If the device can be used with multiple drugs and multiple routes of administration, select a total of three drugs that are commonly used from the three most common routes of administration. For example, if evaluating an infusion pump that is intended to deliver drugs intravenously and as an epidural, pick two common drugs for intravenous infusion and one for epidural infusion. Once the drug(s) has been selected, pick the simplest formulation of the drug to evaluate drug compatibility and leachables. To address drug compatibility and leachables from the medical device, the experimental approach is divided into two steps. The first step is the determination of extractables from the medical device in controlled extraction studies. 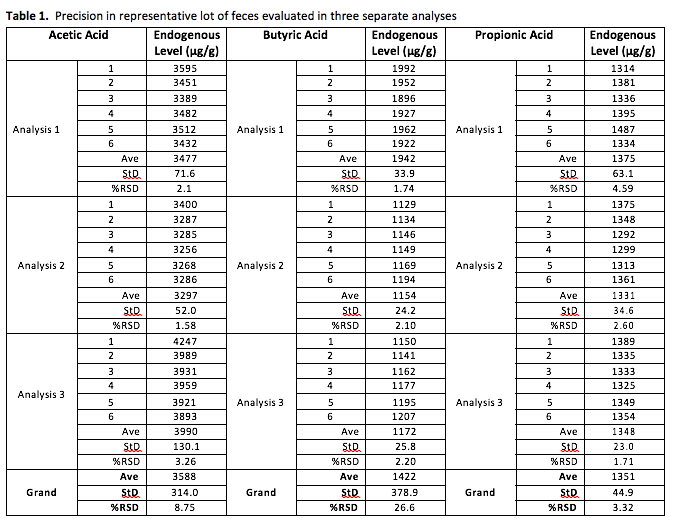 Based upon these results, analytical methods are then developed to be used to evaluate leachables in the second step. The second step is the evaluation of leachables from the medical device into the drug product, and the evaluation of drug stability in the medical device. Only the components of the medical device that directly contact the drug product need to be included in the controlled extraction study although other components can be included if deemed to present a significant risk. Separating components of the medical device for extractions will facilitate the identification of extractables, but the medical device can be extracted intact if separation is not practical. An overview of the controlled extraction study can be found in Table 1 and is similar to what is done for a sample container closure system following the PQRI guidance for E&L testing of OINDP. The medical device is extracted in a polar solvent and a non-polar solvent with the solvents selected based on the representative drug products. The extraction type is based on the solvent type and the analytical methods for analysis of extractables are the same for all extractions. Extractables are identified by MS and quantitated against structurally similar standards. Once the extractable profile of the medical device has been determined, analytical methods are then developed that can analyze for the extractables present as leachables in the representative drug products. 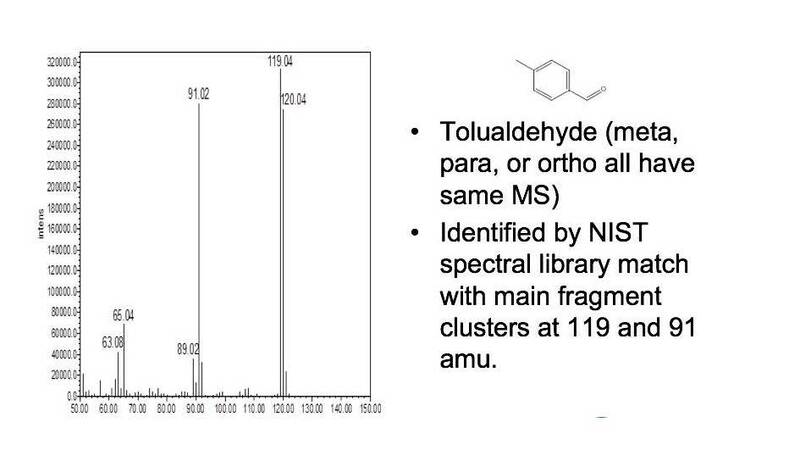 Hopefully GC-FID and HPLC-UV methods can be developed for the organic leachables, but detection by MS may still be needed based upon the extractables identified and the number of unknowns. For both methodologies the drug may present significant interference for detection of potential leachables and extensive sample preparations, like liquid-liquid extractions, may be required. For inorganic leachables, ICP- MS is commonly used. All of these methods should be validated for accuracy, precision, specificity, LOD/LOQ and linearity. Acceptance criteria for validation should be set based upon the demonstrated performance of the method and the intended use of the method. Analytical assay methods are also needed to demonstrate the stability and compatibility of each drug with the medical device. If available, the USP method for the drug product should be used. If a USP method is not available for the drug product, an analytical assay method will need to be developed and validated. Once all methods are in place, the experimental steps shown in Table 2 are followed. Collect representative aliquots at end (and intermediate time points depending upon length of time dispensed). Assay dispensed sample and control. Calculate the difference between the two. Analyze dispensed sample and control by leachables method. Exclude any leachables that are also observed in control at a similar level. Acceptance criteria are not universally defined. For assay we recommend setting the difference between the control and the sample to be the same as the USP acceptance criteria for assay. For example, if the USP method has the assay value for a drug product to be +/- 10.0 % of label claim, the acceptance criteria for compatibility should be that the assay value for the sample be within +/- 10.0% of the assay value of the control. For leachables and medical device impurities we recommend using the same acceptance criteria as process impurities of 0.05% of the drug product label claim. a greater amount of a chemical constituent being released as compared to the amount generated under the simulated conditions of use”. An exaggerated extraction study is a forced extraction study to generate a complete extractable profile for hazard identification and is required by ISO 10993-12 to be exhaustive. The second experiment is a simulated use experiment which is defined in ISO 10993-12 as “evaluating leachable material levels available to the patient or user from devices during the routine use of a device using an extraction method that simulates product use.” The experimental conditions in a simulated use experiment are modeled after the intended tissue environment for the device with the goal of determining leachable exposure to the patient. An overview of the exaggerated extraction study can be found in Table 3. The key decision in study design is solvent selection. For an exaggerated extraction study, the extraction solvents are selected based upon the anticipated tissues the device will encounter. The extraction type is based on the solvent type and the analytical methods for analysis of extractables are the same for all extractions. For exaggerated extractions, the extraction must be proven to be exhaustive, therefore extraction time is established experimentally. Extractables are identified by MS and quantitated against structurally similar standards. 2. Non-polar – vegetable oil, ethanol/water, ethanol/saline, polyethylene glycol 400, dimethyl-sulfoxide, culture media with serum. 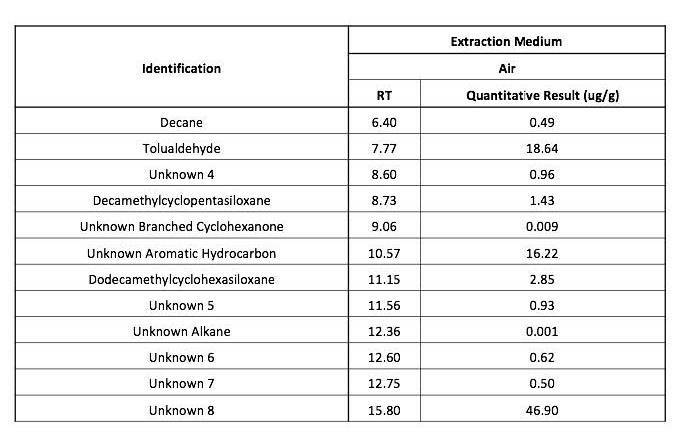 An overview of the simulated use extraction study can be found in Table 4. Again the key decision in study design is solvent selection. Like the exaggerated extraction study, the extraction solvents are selected based upon the anticipated tissues the device will encounter and the results of the exaggerated extraction study. The extraction type is batch extraction with agitation and the analytical methods for analysis of leachables are the same for all solvents. The extraction conditions should be the highest temperature listed that does not exceed the glass transition temperature of the material. Leachables are identified by MS and quantitated against structurally similar standards. 2. Non-polar – vegetable oil, ethanol/water, ethanol/saline, polyethylene glycol 400, dimethyl- sulfoxide, culture media with serum. 10993-12. A risk based approach method to set acceptance criteria that includes a toxicological evaluation of each extractable and leachable is presented in ISO 10993-17 but this approach may not be recognized by the FDA. A second option would be to use a predefined default level appropriate for the device and its intended use. considered and can be different for the above two extraction studies. Depending upon the amount of drug in or on the device, a “placebo” device without drug may be considered for the exaggerated extraction study to avoid excessive interferences from the drug in the identification of extractables. However, the final medical device including the drug should be used in the simulated use experiment since the presence of the drug could effect the migration of the leachables from the device. OINDP for medical devices in where the route of entry for leachables is in a drug product, and a second study design was presented based only on ISO 10993-12 for use on medical devices where the leachable route of entry is from direct tissue contact. Both study designs have been used to support successful 510(k) submissions. There should already be in place a strong quality program at the CRO and the quality agreement must make a good fit to this program. Those concerns (terms) that are rather common to Quality Agreements should already be addressed in the existing quality program at the CRO or else consideration must be given to incorporating them into the existing program. This approach is distinctly different and better than leaving them only in the quality agreement. To leave important concerns only in the quality agreement is tantamount to instructing the lab to only consider doing such quality work when working on this particular client’s project. Good news: At the end of the stability study, all leachables were below the AET. Bad News: One (or more) leachable exceeded the AET at or before the intended shelf life. Assess toxicity of the leachable to determine if SCT was appropriate. If SCT increases after assessment, AET can increase. If after confirmation and toxicity assessment the leachable is still above the AET, shelf life must decrease to time when leachable was below AET. In worst case scenario, a new container closure system may be needed. Pine Lake Laboratories is a GLP/GMP compliant analytical and bioanalytical contract testing laboratory. Our lab, located in Bristol, CT, is FDA registered and inspected and DEA licensed for Schedules 1 through V.
© Pine Lake Laboratories 2019. All Rights Reserved.